Labor has long been a driving force in elections, and the 2018 midterms were no exception. In a historic, and critical, election for working people, labor not only played a powerful role in organizing, funding and turning out the vote for pro-labor candidates, they elected an unprecedented number of their own to office. On election night Nine Hundred and Three union members were elected to public office, from statehouses to the halls of Congress. Included among the new voices for working people are Senator-elect Jacky Rosen (D-NV), a member of Unite Here; and Governors-elect Gretchen Whitmer (D-MI) with AFT and Tim Walz (D-MN), with Education Minnesota, along with pro-worker governors in Wisconsin, Illinois, Pennsylvania, Nevada, Colorado, Maine and Kansas. 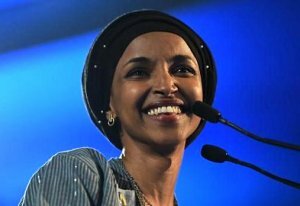 In the US House, labor welcomed Congresswoman-elect Jahana Hayes (D-CT) of CEA and AFSA, and Congresswoman-elect Ilhan Omar (D-MN), a member of AFSCME and the first Somali-American elected to Congress. These wins were essential for labor, which has witnessed a declining membership, now at just 10.7% of the workforce, and unrelenting a ttacks on their rights under the Trump White House. The wars waged in the courts, however, have delivered the greatest blow to the future of labor. In July, the US Supreme Court ruled against unions in Janus v. AFSCME by stripping them of their power to collect dues or fair share fees from members who benefit from their collective bargaining. The decision depletes critical rights and financial resources. Unions have been battling similar "Right-to-Work" legislation in the states, 27 of which have a form of the anti-labor statutes on the books. Those fights have not gone without victories, however. In August, Missourians voted two to one to overturn the state's right-to-work law. Last week also sent two anti-labor Governors packing. 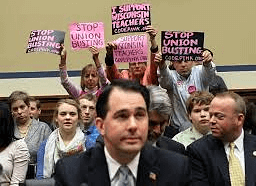 Union busting Governor Scott Walker (R-WI), who famously stripped Wisconsin public employees of their collective bargaining rights in 2010, and later signed a right-to-work law and repeal of the prevailing wage, was defeated in his bid for a third term by educator Tony Evers, 49.6% to 48.4%. In Illinois, Governor Bruce Rauner (R), who filed the initial 2015 lawsuit that led to the Janus decision, was soundly ousted by J.B. Pritzker (D) 54.2% to 39.2%. 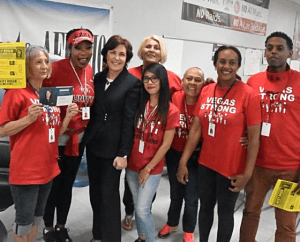 Labor has also traditionally been the backbone of organizing in elections and the close to 100 national unions and affiliates turned out their members in mass numbers. 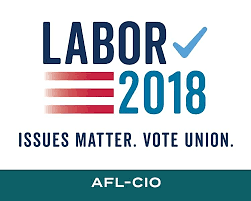 According to the AFL-CIO, the largest umbrella federation for labor, Union members knocked on more than 2.3 million doors this election cycle, distributed 5 million fliers at more than 4,600 worksites, sent more than 260,000 texts, and delivered over 12 million pieces of direct mail. Labor also invested heavily in the 2018 elections, contributing roughly $133 million to candidates, political parties, super PACs and outside groups. Despite the numbers, this is still an estimated 1/16 of what business interests spent. It is yet to be determined how much the recent court rulings will impact the power of labor's purse in the coming years, but the disparity between the haves and the have-nots is widening, and any economist can tell you that correlates to the decline in unionization. A strong labor movement means a strong middle class and, in this cycle, a strong Democratic party. 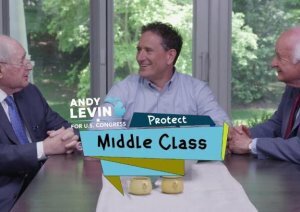 Help DemList Continue after the Election with a Contribution Here!